The motto of Haley Strategic Train – “Thinkers before Shooters” – is very attractive to me. Thinking is a big part of my job as a professor after all. Observing a recent D5 Disruptive Science Handgun course in North Carolina allowed me to see this motto in action. D5 does not refer to the level of the course – e.g., there is no D1 course, and the D3 (Disruptive Environments) course is actually more advanced. Rather, the 5 in D5 is supposed to mimic the letter “S,” as in Disruptive 5cience. As a basic course in shooting – or, Haley calls it, weapon manipulation – D5 on the surface resembles many contemporary courses. The students learn in the classroom and practice on the range essentials such as stance, draw, grip, presentation, sight alignment and sight picture, trigger manipulation, reloads, malfunction clearances, multiple target engagement, and movement. Haley introduces these components in a slightly different way than in most courses I have observed. He divides the basics of weapon manipulation into three parts, “feel,” “eyes,” and “finger,” as seen on the target he uses frequently in class. FEEL is covered on day 1, when the students shoot a baseline drill, are introduced to biomechanics, and learn natural point of aim, stance, grip, presentation, and reloads. EYES are covered on day 2, introduced by a discussion of body alarm response and stress adaptation in relation to vision and target accommodation leading to precision (clear front sight) vs. stress (clear target) sight pictures. FINGER is also covered on day 2 in connection with trigger control. Students also work on reloads and the draw. Day 2 ends with a repeat of the baseline drill shot at the start of day 1. Most of day 3 is spent on the range working on malfunction clearances, engaging multiple targets (the 2-2-4-2-2 drill Haley is known for), movement (side-to-side, backward, and forward), and shooting while moving (forward, backward, and sideways). 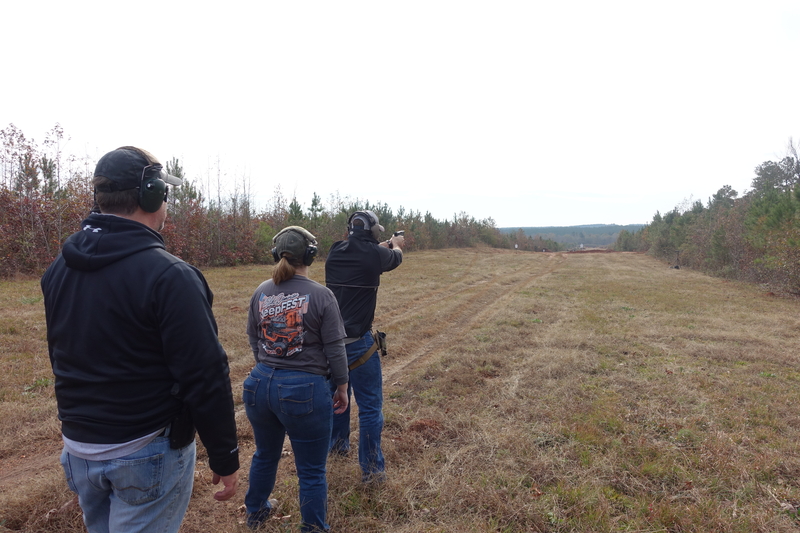 Thought of in terms of Jeff Cooper’s foundational Gunsite 250 Pistol course, Haley covers marksmanship and gunhandling largely in days 1 and 2. 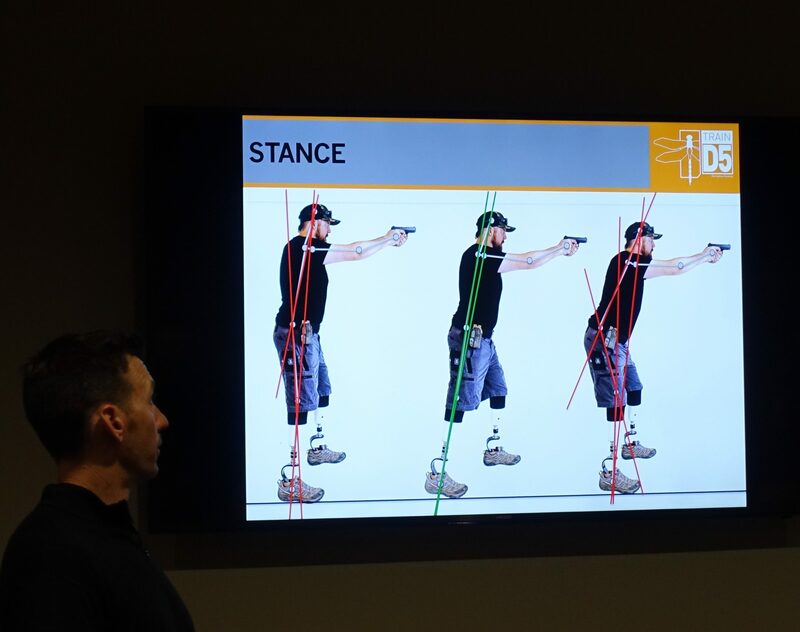 In terms of the components of weapon manipulation, what Travis Haley teaches in his D5 is in line with what all firearms instructors teach. Stance, get gun out of holster, grip, present, sight picture, and press the trigger, engage multiple targets, move, reload, and clear malfunctions as necessary. From what I could see, most of the students improved over the three days, some quite dramatically. I noted in particular that he was able to coach his students to perform 1.5 second draws (many sub-1.0 second) in fairly short order. 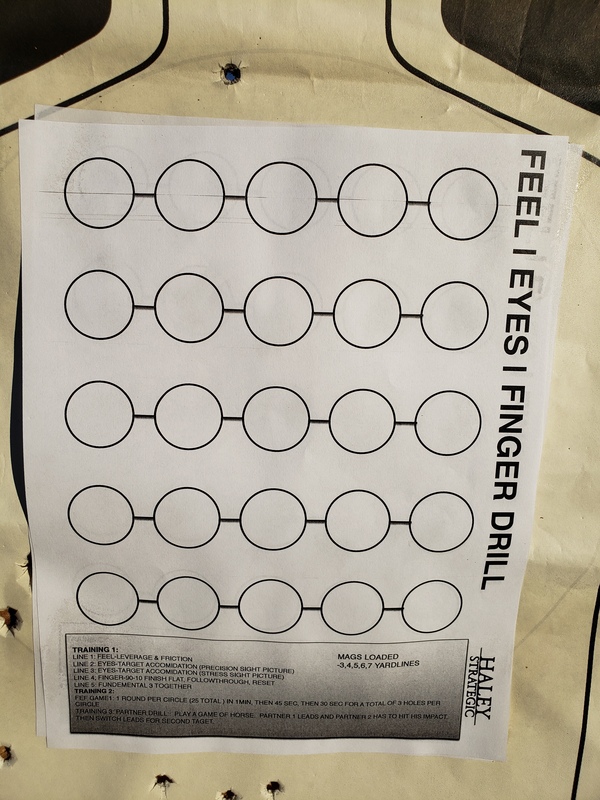 The student who was by far the worst shooter on day 1 – his 3 yard target looked like it was shot with a scattergun – hit a C-zone steel target (12” x 20”) at 100 yards in his second attempt on day 3. 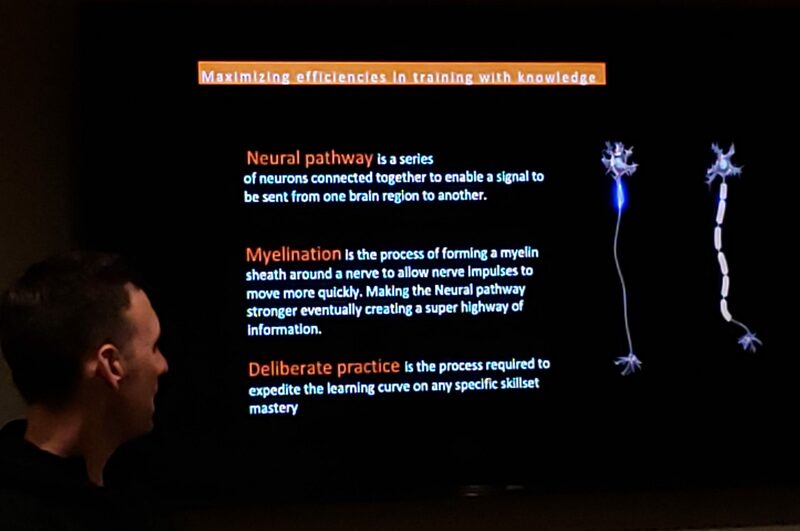 In the first place, Haley grounds the techniques he teaches in science, particularly what he has been able to adapt from studies of sports performance generally. Here biomechanics plays a key role. Haley observes that there have been no studies of the biomechanics of shooting, in comparison to the hundreds that have been done on other sports (notably golf). So he adapts what he can from those studies, as well as from other fields like ballroom dancing and cooking. Haley advises students in the first classroom session, “Write your own story of this class,” because “it is less important what you know on day 3 of the course than on what you take with you on day 4, day 5, day 6,” and so on. The individual is of first importance not the system. Remember that man created method and not that method created man. And do not strain yourself in twisting into someone’s preconceived pattern, which unquestionably would be appropriate for him, but not necessarily for you. This echoes the anti-branding stance Haley takes toward gun training that I discussed in my last post. Tags: Haley Strategic Partners, North Carolina, Travis Haley. Bookmark the permalink. 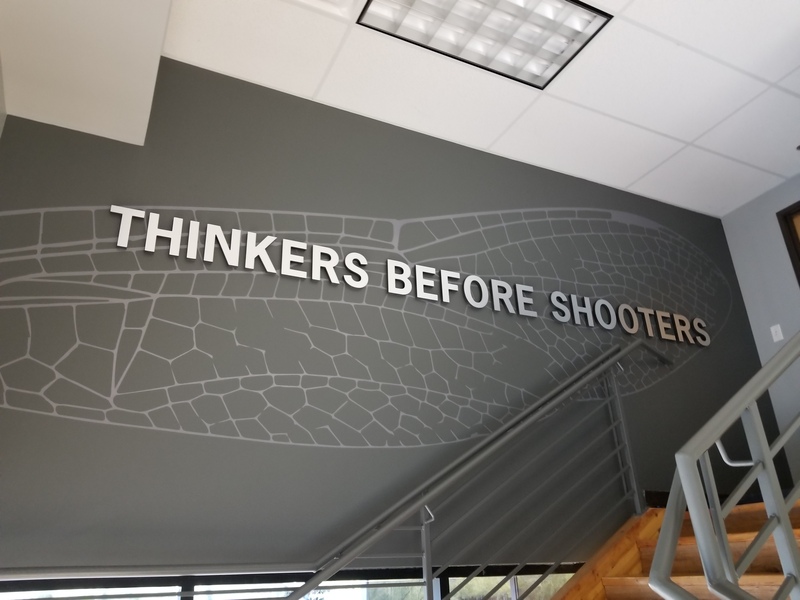 Thanks for clarifying Haley’s, “thinkers before shooters” motto as the thinking part is about the “why” a particular skill, stance, technique, etc. is done as opposed to a more cognitive defensive/tactical approach. Building a solid, biomechanically stable shooting platform provides a good foundation for accurate, rapid presentation and shooting accuracy. Understanding why a technique is being taught, providing it has a rational biomechanical basis rather than someone’s personal preference, is a key to skill enhancement. Better biomechanical efficiency equals more effectiveness which might make all the difference in a fight. Speaking of learning. It is interesting that four hours of class time is devoted to, “learning how people learn and placing the individual at the center of the learning process.” Despite being perpetuated in academia, different learning styles are a myth. How information gets to the brain may be of interest, but neurologically all brains learn the same way. Would it not be better to put the student’s brain at the center of the learning process to get essential skills consolidated into procedural memory? If you want to learn more, check out this article on Dustin Salomon’s Building Shooters blog, (https://www.buildingshooters.com/articles/tag/training%20myths/page/2 ). Mr. Haley is correct when he says, “people have physical and psychological differences. You need to understand those differences to maximize performance.” But, it’s our individual physical and psychological differences that affect our individual performance, not so-called different learning styles. David, thank you for the first-hand look at Mr. Haley’s training model. I am not up on the current view of learning styles these days, but I think I didn’t express myself clearly enough because that is not really what Haley is talking about anyway. He places a big emphasis on challenging homeostasis as a way of developing potential, especially via Anders Ericcson’s idea of deliberate practice, talks about the importance of resourcefulness over resources, highlights the importance of active over passive learning,distinguishes between a training and trusting mindset, emphasizes the importance of the what Kolbe calls people’s “conative” action orientations (www.kolbe.com/assessments/kolbe-a-index), and so on. Can’t argue with that. Have read Kolbe in past, nothing new there. Keep up the good work. Thanks and interesting! I had never heard of Kolbe until I spoke to Haley, and have still never seen Kolbe referenced anywhere else. Perhaps because I am a sociologist by training and not a psychologist, and the fact that she is running a company not doing academic work. In what context did you read Kolbe? I ran across Kolbe’s material while researching performance based shooting programs. Models to accentuate positive personal traits and diminish the negative have been around forever. Every college freshman has taken such an inventory. Kolbe just plugged her model into a computer program and monetized it. All such models have value. It just depends on your personal philosophical, social, religious orientation, etc. I’m personally drawn to the Chassidic Masters as opposed to more secular models, but that’s just me. It is an interesting concept of mixing a personal development model with firearms training; then again, maybe not. Unfortunately only the surface of such a topic can be scratched. A good model would go deeper than just discussing mindset. I wonder if any similar programs presently exist within the training industry. Every firearm owner needs to look deeply into their own moral, ethical, religious base to answer the fundamental question: can I in good conscious take a human life to save my own, a loved one or an innocent stranger? If you can’t answer that question in the affirmative, regardless of your reasoning, then don’t own a gun. Maybe that discussion needs to be the first topic for every concealed carry class. I would say Massad Ayoob’s MAG-20 addresses the questions you raise. Haley addresses them also, albeit more briefly. As you note, a 3 day, 30 hour course covers alot more than a normal person can assimilate. Would be great if these questions could be taken up in all CCW classes. I have been in classes though where the instructor says if you carry a gun you need to be willing and able to kill another person. And people have not completed the course because they had doubts.